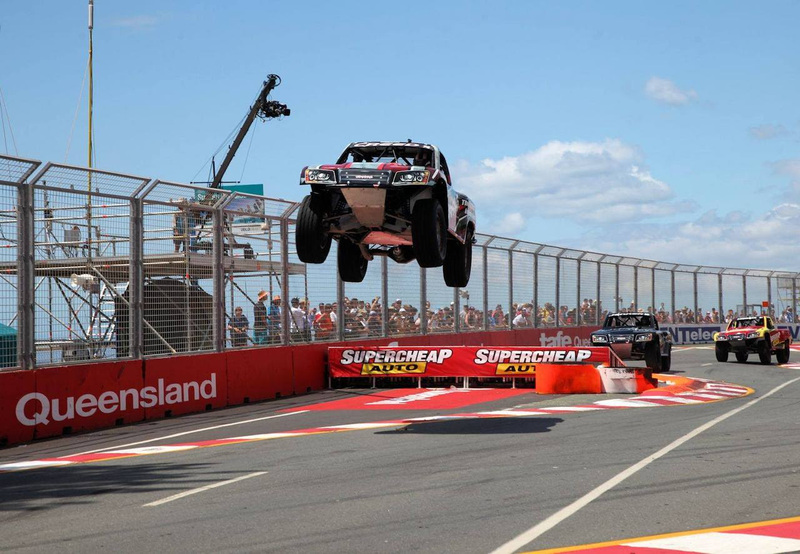 GOLD COAST, Queensland (October 25, 2015) – Famed Australian stunt man and SST driver Matt Mingay captured his first Stadium SUPER Trucks Presented by TRAXXAS victory in exciting fashion Sunday in the SST TRAXXAS trucks finale of the Gold Coast 600 on the temporary beach side street circuit in Surfers Paradise in front of another capacity crowd. Mingay, a resident of Gold Coast, Queensland whom lives just steps away from the race circuit drove his No. 2 Hot Wheels/ Castrol EDGE-sponsored truck in the shadows of Norwell, Queensland SST newcomer Paul Morris from the start of the l0-lap shootout, as the two Australian’s wasted no time moving to the front of the pack from there sixth and seventh starting positions. Lap-3 leader Brett Thomas from Gold Coast, Queensland would spin after contact with Crandon, Wisc. driver Keegan Kincaid. The contact would allow Morris and Mingay slip by Kincaid into the top two positions. This would set up a tremendous three-truck battle for the final five laps of the race. Mingay, Morris, and Kincaid put on a show for the capacity crowd as the three trucks battled corner to corner, sliding sideways, making contact, smoking the Toyo Open Country A/T II tires and maneuvering their 600-horsepower TRAXXAS trucks around the track much to the delight of the ecstatic crowd. As the white flag flew Mingay would set up Morris for a final pass. As Morris missed his mark in turn 5 Mingay aggressively moved into the lead position. Mingay would go on to the win his first SST race, followed by Morris, and Kincaid rounding out the podium. Burt Jenner from Los Angeles, Calif. would finish in the fourth position in his Gladiator Tires truck, as Traxxas driver Sheldon Creed from Alpine, Calif. would recover from contact early in the event to finish the race in the fifth position. Def Leppard/LIVE/Think Loud Recordings teammates of Scotty Steele from Peoria, Ariz. and Nazareth, Penn. driver Bill Hynes would finish sixth and seventh respectively. Orange, Calif. driver Robby Gordon was eighth in his Xbox One/Halo 5 Guardians/SPEED Energy No. 7 followed by early race leader Australian Brett Thomas in the TFH Hire/Illuminated Water truck. Matthew Brabham from Gold Coast, Queensland in the Def Leppard/LIVE/Thinking Loud Recordings truck was credited with tenth after making hard contact with the wall on Lap-3. Penola, South Australia driver Greg Gartner in the No. 14 Toyo Tires/ Clipsal 500 SST truck was credited with eleventh after having an early mechanical problem. Morris, one of the most versatile drivers in all of Australia capitalized on two podiums finishes in his first weekend behind the wheel of a SST truck to claim the overall weekend victory. 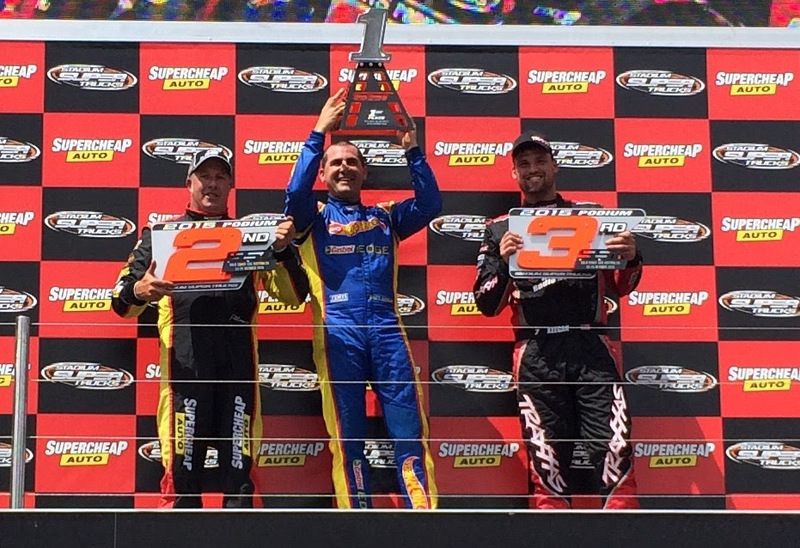 Creed would finish second overall, with Matt Mingay claiming third. Earlier in the morning SST Championship points leader Sheldon Creed would go on to win Sunday’s first round of the SPEED Energy Stadium SUPER Trucks Presented by TRAXXAS (SST) at the Gold Coast 600 in Gold Coast, Queensland, beating Peoria, Ariz. driver Scotty Steele. Robby Gordon debuting a new X Box One Halo 5 Guardians paint scheme would cross the line in the third position after a Lap 1 tangle with Paul Morris, Matt Mingay, and Creed. In a very impressive drive Creed would pass every single truck in the field in route to his seventh victory of the year. 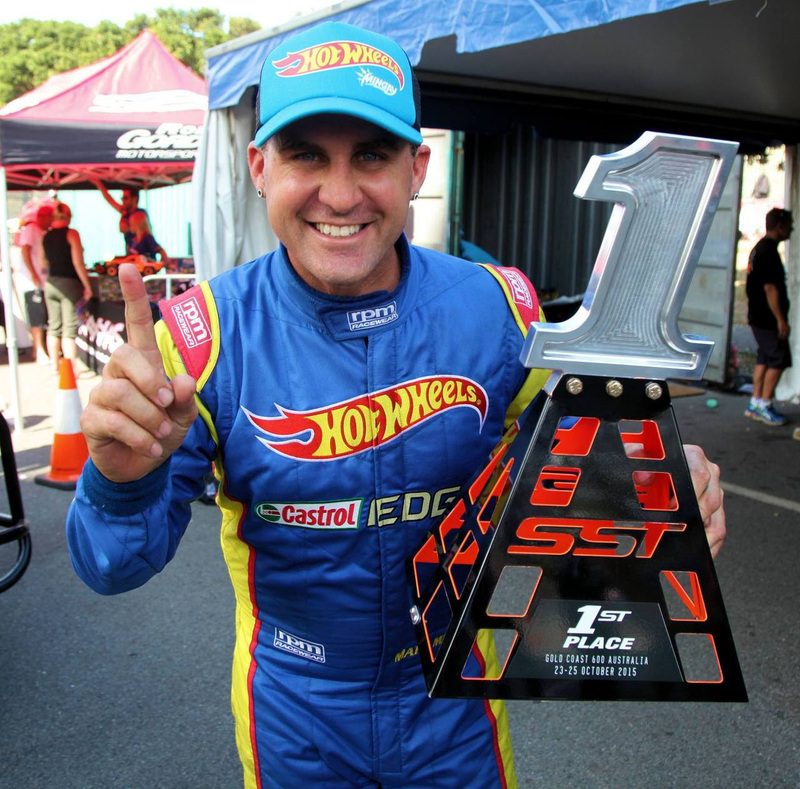 Gold Coast, Queensland driver Matt Mingay was fourth in his Hot Wheels/ Castrol EDGE No. 2 followed by Paul Morris in the SuperCheapAuto.com truck. Greg Gartner from Penola, South Australia in the Toyo Tires/ Clipsal 500 truck was credited with the sixth position. While Gold Coast, Queensland driver Brett Thomas in the No. 69 TFH Hire SST truck finished seventh after leading multiple laps. Nazareth, Penn. driver Bill Hynes driving the Def Leppard/LIVE/ Think Loud Recordings truck finished in the eighth position followed by Friday’s race 1 winner Burt Jenner in the Gladiator Tire truck. Gold Coast, Queensland native Matthew Brabham made heavy contact with the outside retaining wall and was credited with the tenth spot, while TRAXXAS driver Keegan Kincaid was not able to start the race. – Sheldon Creed captured his four and fifth victory of 2015 in Round 15 and 16 at the Sand Sports Super Show in Costa Mesa, Calif.
– Matt Mingay becomes the first ever Australian to win in Stadium SUPER Trucks competition with his Race 4 win at the Gold Coast 600 at Surfers Paradise.